An attractive and engaging mobile game to learn and practice Japanese kanji and vocabulary, while tracking your progress! Over 4,000 common compound words, graded to only include kanji of the same or lower levels. Practice and learn enjoyably and effectively using the games, review list and reference flashcards! This app uses Flash, try the app from the iTunes app store! How to play Kanji Connect! Shows an overview of all kanji in currently selected level(s). Select level(s) of ﻿kanji (25 per level) from the 'Lists') button at the top left of the screen. Kanji are shaded blue to indicate progress (the darker it is the more of that kanji's compound words have been completed). Clicking on any kanji goes to the flashcard view, which gives meanings, readings and compounds for that kanji. Displayed above the grid is the current level number (just lowest if multiple levels selected). 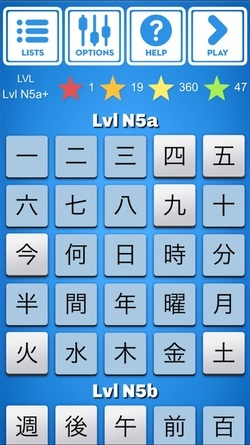 The colored stars show your progress through the compound words by indicating the number of words currently at each rating level. (All words start at yellow, and go up or down depending on whether hints are needed or not. Green indicates completed words, which do not appear in the game again). Up to 20 common compounds are listed for each kanji, with their readings an meanings. A colored star shows the current completion status of each compound, which can be manually adjusted with a tap. 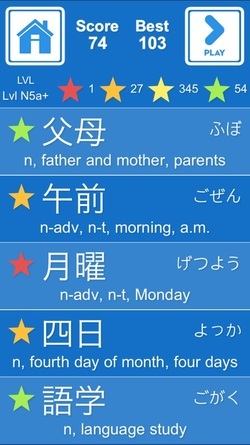 The star for the individual header kanji can be tapped to change ratings for all its compounds at once - useful for checking off known kanji, or 'checking down' lesser-known kanji. NB Its color always reflects the lowest color rating out of all its compounds. 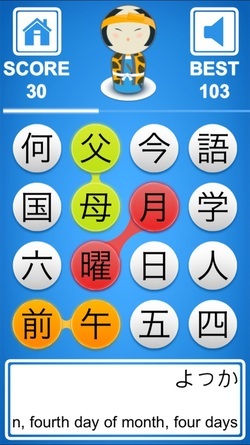 Tap on any kanji to jump to the flashcard for that kanji, using the back button to return if desired. Swipe right or left to progress through flashcards. 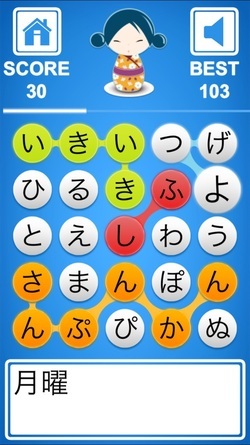 You spell out the target word in the grid by tapping the kanji circles in order. 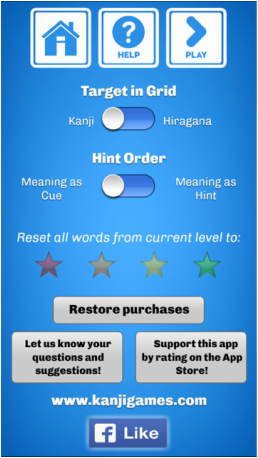 If the kanji circles selected are incorrect (ie not making the target word), the next cue is shown automatically. If you need another hint, you can press the cue box below and the next hint is revealed (either the reading or the meaning, depending on your setting). If you still don't know, pressing the cue box again shows the actual target word which you can then find in the grid. Getting a word correct having been shown only the first hint, means the word's completion status goes up one color rating (words are rated by default as yellow). It's completion status goes down one color rating for each additional cue shown or mistake made. i.e. If one extra cue was shown, the word's completion status goes down one color rating eg from yellow to orange. When a word is found the color of the selected circles indicates the current completion status of the word. e.g. If the word is now fully completed, it will go green. The score is based on word points plus timer points. If you get a word correct from only one cue shown, you get 20 points; if you get a word correct from two cues shown, you get 10 points; if all cues were shown you get 0 points. The points remaining on the timer at the end of the game, if any, are added to the word points to give you your final score. If you get more than 100 points (from word points + timer points), you pass the stage and continue to build on your score in the next stage. A high score is shown that is renewed every Sunday so you can challenge yourself to get a weekly high score. Relaxing koto sounds play as you select kanji circles, playing a chord when a word has been found correctly. These can be turned off (so you can listen to your own choice of music while playing) by tapping the sound icon in the top right-hand corner. You can set in 'Options' whether to have the kanji or the hiragana reading in the game grid, which provides different challenges. n.b. When hiragana are in the grid, the game board is always 5 x 5, to fit all the words in. After a game has finished, a list of the five words from that game and their readings and meanings are shown. The current completion status of the words are shown as colored stars. N.B. These stars' colors can be manually adjusted simply by tapping them to cycle through the colors. This is so you can either check words off (ie rate them green) if you don't feel a need to have that word appear in further games, or rate them lower if you feel you actually need more practice with a particular word. Target in Grid - You can choose to have the hiragana reading in the grid rather than the actual kanji compound. NB this hiragana version is always 5 x 5, in order to fit all the words in the grid. Meaning Hint First - the English meaning will be shown as the first hint below the game, rather than the kanji or hiragana. Grid Size - Option of 4 x 4 or 5 x 5 grids for the 'kanji grid' mode. Reset all words - You can reset all the words in the current level(s) to a specified color. 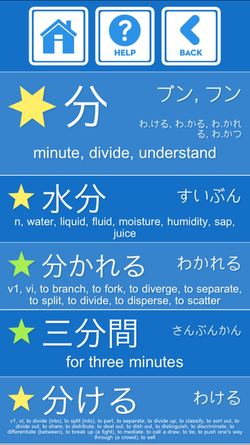 eg You can reset all the words back to yellow after finishing all the words to start again; or if you just want to practice certain words from a level, you could rate all the words green, then choose just the kanji you want to practice from the main grid and manually rate them down to yellow (or lower) by tapping the rating star on the flashcard next to the header kanji. Feedback Button - if you are having issues or have suggestions, leave feedback directly to us via this button!